The perfect armour for the true woodland warrior, the Woodland Tree Bark Tassets feature a delightful design of intricately engraved wood grain pattern and three plates with the edges curled to resemble natural tree bark. This wonderful emulation of nature is exquisitely detailed achieving a realistic look. Due to the plated construction these tassets allow for superb flexibility and will not impede the ability to perform the athletic maneuvers which are necessary for success on the battlefield. These tassets are designed to be easily worn on any belt up to 3 inches wide. They are crafted from medium weight 7/8 ounce leather and accented by antique brass hardware. 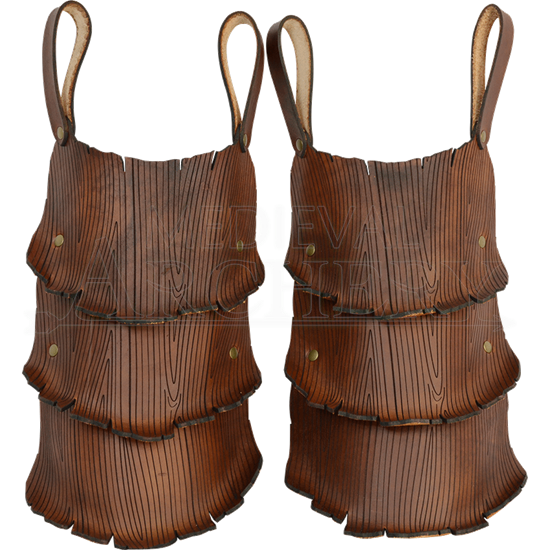 The Woodland Tree Bark Tassets are an extraordinary addition to the combat gear of any LARPer and to fully embody a look of nature we suggest pairing them with the Woodland Tree Bark Pauldrons (DK5109) and other armour from our woodland collection.